Birth of the Pipesnakes ON SALE NOW! 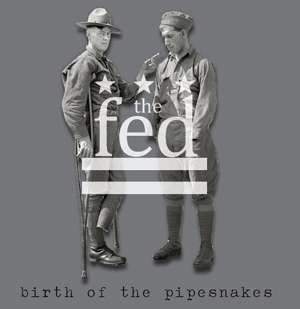 the fed is set to release it’s first EP, birth of the pipesnakes, on February 9, 2011. Stay tuned to find out how you can get your copy on vinyl with a free digital download with purchase. Until then, check us out on DC101 Local Lix on Sunday, Feb. 6 @ 10pm and at our next show, February 9 @ 9pm at Level X Lounge (1934 9th St. NW, DC).